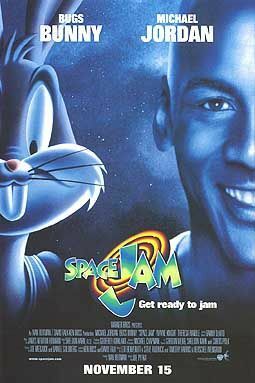 Space Jam is a 1996 American live-action/animated film starring Michael Jordan, Bugs Bunny (voiced by Billy West), Daffy Duck (voiced by Dee Bradley Baker) and the rest of the Looney Tunes characters. It also features the debut of newcommer Lola Bunny (voiced by Kath Soucie). It was produced by Ivan Reitman, and directed by Joe Pytka (live-action), Tony Cervone, and Bruce W. Smith (animation). The film was released theatrically by Warner Bros. Family Entertainment on November 15, 1996. The film was also converted into a pinball game by Sega and a video game by Acclaim Entertainment. Space Jam received mixed reviews. According to Rotten Tomatoes, only 37% of critics, and 46% of their selected "Top Critics", gave the film a positive review. 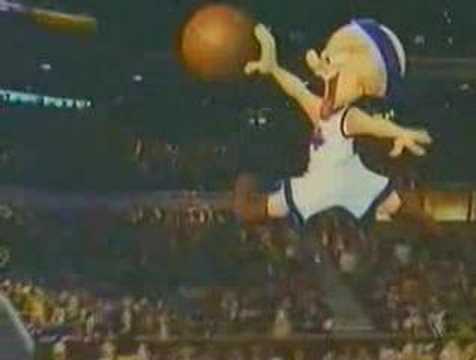 Roger Ebert gave Space Jam an enthusiastic "thumbs up," which Gene Siskel also gave the film, although his zeal was more subdued (both are Chicago natives). Leonard Maltin also gave the film a positive review. Some critics compared it unfavorably to Who Framed Roger Rabbit, a popular film in which cartoon characters and live-action humans coexisted. The soundtrack sold enough albums to be certified as 6x Platinum. It also served as a high point for musical artist R. Kelly, whose song "I Believe I Can Fly" became a hit after it was featured on the film's soundtrack. Other tracks included a cover of "Fly Like an Eagle" (by Seal), "Hit 'Em High (The Monstars' Anthem)" (by B-Real, Busta Rhymes, Coolio, LL Cool J, and Method Man), "Basketball Jones" (by Chris Rock & Barry White), and "For You I Will" (by Monica). The movie's theme song was performed by the Quad City DJ's.